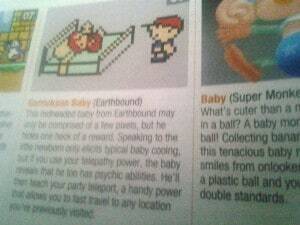 So I’m flipping through my latest issue of Game Informer, and then come to their top 10, which is about babies. 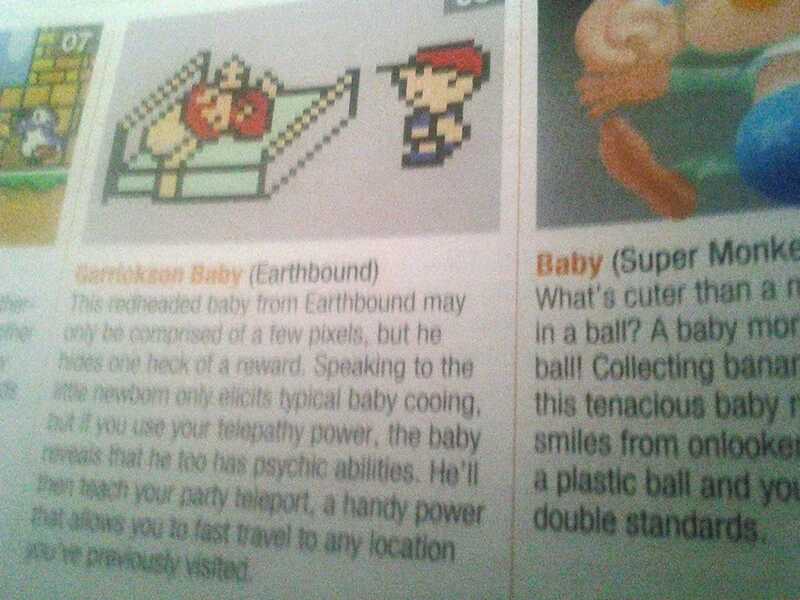 Suddenly I see #8, which is the Garrickson Baby from Earthbound Zero (though the magazine just calls it “Earthbound”) It talks about how if you use Telepathy on the baby, he’ll teach you the PSI move Teleport. I thought this was a very interesting find! Even more interesting since it’s technically an unreleased game over here. Oh god, no more Derrek Ogilvie references please. Ha, I see in the corner that baby Yoshi made the list too. I was so surprised when I found that in my issue of Game Informer. Mill’s right, EB0 is an unreleased game, so either Nintendo’s cooking up something, or someone at GI knows how to work an emulator. This is definitely one of the more interesting parts of the game for me. Wow pretty cool, if I wasn’t so dumb and I knew how to use an emulator my life would be so much happier. Well, atleast I have a repo cart. Game Informer has always been the best! In the west part of Easter. I was definitely surprised to see this in the magazine. 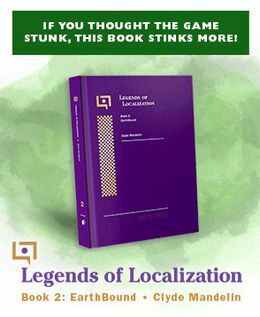 It was my understanding that as a general rule, gaming publications that want to stay on the good side of game publishers (so as to continue to receive review copies, game previews, and whatnot) refused to acknowledge emulation. So it seems like Game Informer is walking on the wild side with this one, as I find it EXTREMELY unlikely that THIS would be the only hint Nintendo allowed to be released that some game release was imminent, especially with E3 just come and gone. Hmm. Even though he isn’t technically a baby, I’m just surprised they didn’t have either Giegue or Giygas. The evil baby villain wants attention too! EB 0 never existed as anything but a rom. Mother was called Mother, period. When the emulation scene translated the rom of Mother they called it Earthbound 0. Eartbound 0 was never a concept for the game’s name even when it was planned on being released stateside. The title was simply Mother. So when GI called it Earthbound they were doing it right. ^ Mother 1’s US release was going to be titled “Earth Bound'” with 2 words So if you want to get in specifics, they got it wrong . I know it’s no big deal; I’m just sayin’. No Earthbound as a game title did not exist till Mother 2 came stateside. Mother was never called anything other than Mother period. Actually Zer0boy, it technically did. Did as in past-tense, as the official trademark for it died in 1992. Hey Tomato. Also, what are you gonna do with the EarthBound SNES review scan I made for you? …bits of rudimentary localization in it. I find it odd, that they’d show earthbound zero.. I mean the only ways to play the game are A: use emulators, or get a reproduction cart,or B: Have a Japanese cartridge. Either game informer broke some rules, or there’s a 0.00000000000000000001% chance of a wii u virtual console re-release.. Still, highly unlikely. MOTHER is MOTHER in Japan. It was going to be “Earth Bound” (two words) in the states on the NES, but it was never released. AND IT WAS translated by Nintendo OFFICIALLY. It bugs me when people say it’s a fan translation because IT’S NOT. The only thing Demiforce changed about it was they added “zero” to the title screen to avoid confusion with the already out “Earthbound” on SNES.